This is the first installment of a special two-part edition of this blog to commemorate DNA Day and a grand event that resulted in a special delivery today. Part one describes a serious health threat. Part two, Our DNA Day Miracle, will be an upbeat response to that threat. In recent years our family has been introduced to the Brugada Syndrome. The Mayo Clinic tells us, "Brugada (brew-GAH-dah) syndrome is a potentially life-threatening heart rhythm disorder." Brugada syndrome is a condition that causes a disruption of the heart's normal rhythm. If untreated, the irregular heartbeats can cause fainting (syncope), seizures, difficulty breathing, or sudden death. These complications typically occur when an affected person is resting or asleep. Brugada syndrome usually becomes apparent in adulthood, although signs and symptoms, including sudden death, can occur any time from early infancy to old age. The mean age of sudden death is approximately 40 years. This condition may explain some cases of sudden infant death syndrome (SIDS), which is a major cause of death in babies younger than one year. It is characterized by sudden and unexplained death, usually during sleep. The exact prevalence of Brugada syndrome is unknown, although it is estimated to affect 5 in 10,000 people worldwide. What genes are related to Brugada syndrome? Mutations in the SCN5A gene cause Brugada syndrome. How do people inherit Brugada syndrome? Most of you are familiar with the normal rules of autosomal inheritance. Half comes from the father and half from the mother. At each location on the autosomes each parent, in a seemingly random process, selects for transmission to the child one of the two values each of them inherited from the grandparents (their parents). In the case of disorders carried by autosomal dominance, the children are affected if they inherit an affected gene from even one parent. Bottom line: each child of an affected parent have a 50% probability of inheriting the disorder. As you know if you flip a coin 4 times, there is a possibility that it will come up heads all four times. Likewise it is possible that the couple in the above illustration will have 4 unaffected children. The odds against that happening are 16 to 1. Those are the same odds that all 4 children will be affected. The most likely outcome, the one illustrated above, is that 2 children are affected and 2 are not. The odds of getting exactly that result turns out to be 6 in 16. For anyone becoming a parent is a very serious endeavor that involves life changing commitments. 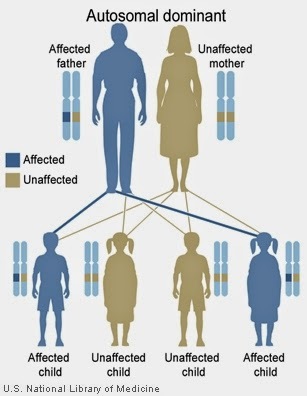 For adults carrying a gene for a serious disorder that is inherited in an autosomal dominant pattern, becoming a parent is much more problematic. This situation is compounded by the fact that we are just learning about many disorders like Brugada which are inherited in this way. In the specific case of Brugada, affected individuals may be asymptomatic until they near 40. As a result they may have already made and acted on their decisions to become a parent. Unless the disorder has already been discovered within the family, there may be no advanced warning. If Brugada (or another autosomal dominant disorder) is discovered couples wishing to avoid transmitting the disorder now have a cutting edge option. 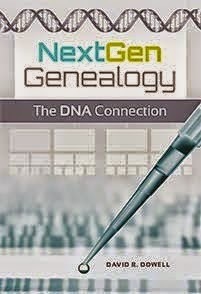 I'll be giving an example of one such case in the second part of this special DNA Day post.